A warm light filled the small church. John smiled as his mother pressed the organ key, calling choir voices to soar through the air above her head. A part of him soared, too. Suddenly the fiery voice of Reverend Blair made John sit up. Always full of questions–about God, about everything–John took in every word. His grandfather spoke about the power of the Spirit to guide and and heal–no matter what. This was a promise John would never forget. ﻿For the young John Coltrane his first twelve years were joyful and warm, filled with the music of his father’s singing, the sounds of the organ and choir, and the joys of family life in his grandfather’s big house with his parents and his cousin Mary’s family. But with the death of his grandfather, father, and uncle in close succession, the family lost its anchor and its music. John’s loss brought deep sadness, until another minister, recruiting young people for a church band, found him a used saxophone. John began to make his own music again. One of John’s favorite musicians was Lester Young, who played tenor saxophone. Lester’s sound was bouncy, but deep, laughter sprinkled with tears. For John, it was like an echo of Papa’s voice. John found other musicians to follow, and soon he himself followed them into jazz, always pursuing that “deep music...laughter sprinkled with tears.” He listened to Johnny Hodges and later Charlie “Bird” Parker, hearing sounds that led him on to find that music he held inside. As a young musician he became known, playing with famous bands of the 1940s and early 1950s, touring constantly amid applause and success, but losing touch with his own center, drawn to drink and drugs to fill the void. Restless in spirit, he read about many religions and their own promise of grace. At last, seemingly lost even amid success, he remembered his grandfather’s preaching, the words promising that “the Spirit would heal–no matter what.” He saw all his studies of religion and philosophy as one, offering cleansing and hope, if he could but find his way back, open to receive the promise. Leaving addiction behind, John Coltrane went on to make the most of his gift, His new freedom spilled from his horn in notes that many came to hear. 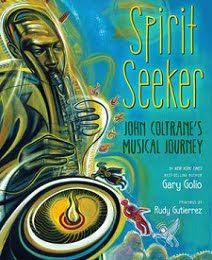 As in his lauded music biographies of Jimi Hendrix and Bob Dylan (Jimi: Sounds Like a Rainbow: A Story of the Young Jimi Hendrix and When Bob Met Woody: The Story of the Young Bob Dylan) with his forthcoming Spirit Seeker: John Coltrane's Musical Journey (Houghton Mifflin Harcourt, 2012) in simple but lyrical text Gary Golio explores the seminal childhood experiences which shaped the music and life of another iconic American musician, another who took in the myriad musical experiences of his early days to produce something uniquely personal yet universal in his music. “Laughter sprinkled with tears” is the essence of jazz, and Galio’s narrative paints a word picture of Coltrane’s spiritual journey to describe what he felt and expressed in his music. Golio’s story is carried along by the work of the Belpre’ Award-winning illustrator Rudy Gutierrez, whose expressionistic art swirls and floods the pages with color, flowing in and around the narrative like music floods the senses. Words are a sort of music, and Golio’s words provide a way for middle readers to find their way to the music and what lies inside it. “Lyrically narrated, resplendently illustrated, and deeply respectful of both subject and audience,” says Kirkus Reviews. Interesting... I like that he believes in God.